Representative Ilhan Omar (D-MN) participates in a news conference to call on Congress to cut funding for ICE (Immigration and Customs Enforcement), at the U.S. Capitol in Washington, U.S. February 7, 2019. Omar, who's among the first Muslim women members of Congress in US history, has maintained that she's not anti-Semitic amid ongoing criticism of her stance toward Israel. "It's all about the Benjamins baby," Omar tweeted in response to a tweet from journalist Glenn Greenwald on GOP House Minority Leader Kevin McCarthy threatening to take "action" against the freshman congresswoman over her criticism of Israel. Subsequently, when asked to clarify what she meant, Omar in a separate tweet seemed to suggest a pro-Israel lobbying group - the American Israeli Public Affairs Committee (AIPAC) - is paying US politicians to support Israel. Omar was swiftly condemned on social media, and the backlash was hardly limited to Republicans. 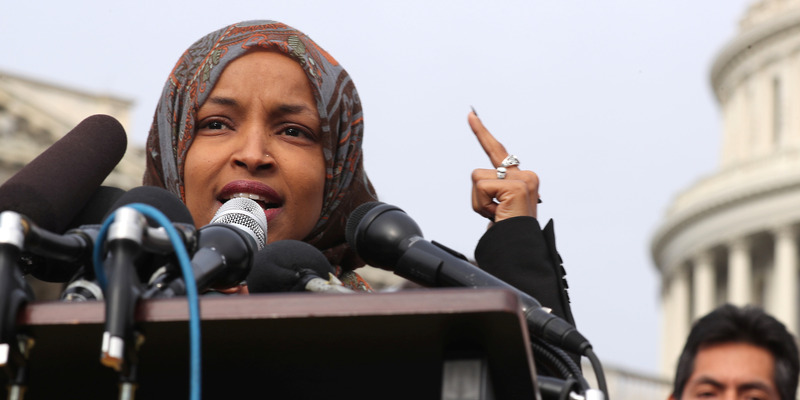 A number of her fellow Democrats expressed concern over Omar's tweets, which many felt played into anti-Semitic tropes about Jews and money. "We cannot remain silent in the face of hateful speech or actions. We know what happens in our communities when leaders ignore or embrace unacceptable rhetoric," the letter states. "That is why we have an obligation to speak out against anti-Semitism and to vigorously confront, challenge, and defeat those who traffic in these harmful tropes and smears." Democratic Rep. Jerry Nadler of New York, who's also Jewish, in a statement said Omar's "choice of words" were "deeply disappointing and disturbing." Nadler, chairman of the House Judiciary Committee and one of the most powerful Democrats in Congress, went on to say, "In this fragile moment in our nation's history, we must all redouble our efforts to engage in policy debates in ways that respect the dignity and humanity of all people." House Foreign Affairs Committee Chairman Eliot L. Engel, a Democrat from New York who's also Jewish, in a statement on Monday called Omar's tweets "unacceptable." "It's shocking to hear a Member of Congress invoke the anti-Semitic trope of 'Jewish money,'" Engel added. "Criticism of American policy toward any country is fair game, but this must be done on policy grounds." Democratic Rep. Ted Deutch of Florida, who's also Jewish, in a statement also said he found Omar's remarks "unacceptable" and "deeply worrisome to the Jewish community." House Speaker Nancy Pelosi was joined by other Democratic leaders on Monday in condemning Omar's remarks. "Anti-Semitism must be called out, confronted and condemned whenever it is encountered, without exception," the statement said. "Congresswoman Omar's use of anti-Semitic tropes and prejudicial accusations about Israel's supporters is deeply offensive," the statement added. "We condemn these remarks and we call upon Congresswoman Omar to immediately apologize for these hurtful comments." Omar is a proponent of the Boycott, Divestment and Sanctions movement (BDS) - a nonviolent, global campaign that seeks to isolate Israel economically and politically regarding its treatment of Palestinians and the occupation of the West Bank. The Minnesota congresswoman has been unabashedly critical of the Israeli government, and in a recent CNN interview said it's "exciting" to see a broader debate happening on the US government's relationship with Israel. "Israel is an ally of the United States and I think as much as you would look to your neighbor, to your friends, to live out the same values as you are, we want to make sure that our allies are living out the same values that we push for here," she added. Omar is hardly the first person in Washington to express concern about organizations like AIPAC or criticize the Israeli government's treatment of Palestine. She's also not the first politician to be accused of anti-Semitism for doing so, as it's long been taboo for generally any US politician to go after Israel. Speaking on the controversy over Omar's tweets, Democratic Rep. Jim Himes of Connecticut on Monday told CNN, "It's perfectly legitimate to criticize Israel or the pro-Israeli lobby. Just please be careful to do it in a way that can't be interpreted as being anti-Semitic." Himes added, "I think this is really a good example of the need for all of us to be very, very specific about what it is we are saying so that we don't come off as being anti-Semitic, racist, bigoted." Amid the ongoing criticism, Omar has maintained that she supports the Jewish community and her comments are directed at the Israeli government in the context of its policy toward Palestine. She's also expressed regret over how she's framed her criticism of Israel in the past. Meanwhile, Omar's spokesman on Sunday told Politico that her "tweets speak for themselves."